Philadelphia naturalist, author, exploring this area, met a Cherokee band led by their chief, Atakullakulla, in May 1776, near this spot. William Bartram, America’s first native-born naturalist, was born near Philadelphia on February 9, 1739. His parents were John Bartram, a naturalist who served King George III, and Ann Mendenhall Bartram. In 1756, William was apprenticed to a Philadelphia merchant and in 1761, when he finished his apprenticeship he moved to Bladen County, North Carolina where his uncle owned a plantation on the Cape Fear River. William opened a store and spent his free time exploring the flora and fauna of the region. During the four years he spent with his family in Bladen County at their home, Ashwood, his mercantile operation was never successful. Next, Bartram accompanied his father on a mission for King George III to Florida. After John returned to Philadelphia, William stayed behind on the St. Johns River and tried his hand at rice and indigo planting. When that venture proved to be unsuccessful, he returned to Philadelphia once again tried to find success as a merchant. By 1770, he was nearly bankrupt. When he was not struggling to keep his fledgling businesses open, Bartram was demonstrating his significant talent as an artist. As early as 1753, he provided patrons in England with drawings of American plants and animals. In 1773, John Fothergill, a London physician and proprietor of the largest botanical garden in England, commissioned Bartram to travel through the southeast collecting objects of natural history. That March he set out on the trip outlined in his book Travels through North and South Carolina, Georgia, East and West Florida. 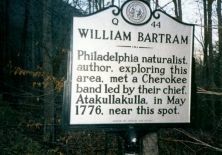 While on his travels in May 1776, in what is now the Nantahala National Forest in Macon County, Bartram encountered a Cherokee band led by chief Atakullakulla. In his writings, he described not only the flora and fauna but also the native Indians, cataloging forty-three towns and villages of the Cherokee nation. Bartram returned to Philadelphia after his expedition in 1777. He published his book, Travels, in 1791. Although Bartram failed to provide Fothergill with much of the actual living material he had requested, the work became the most important description of the southeastern United States during the eighteenth century. William Bartram resided at his family home, Kinsessing, in Philadelphia until his death on July 22, 1823. His final resting place is unknown, but is believed to be near the house.